Bacon & Day Ne Plus Ultra Troubadour Model 3R Model Arch Top Acoustic Guitar (1933), probably Chicago, serial # 33241, sunburst top, natural back and sides finish, rosewood back and sides, spruce top,mahogany neck with ebony fingerboard, vintage tweed hard shell case. This Bacon & Day Ne Plus Ultra Troubadour is a spectacular looking and very rare arch top guitar. It was built in late 1933 when the Bacon Banjo Company was struggling, a victim of the lingering Depression and the declining market for banjos. While the guitar itself was almost certainly made by Regal in Chicago, the decorative touches of engraved painted celluloid and rhinestone are pure Bacon. Bacon & Day instruments were always top quality, and this guitar ranks with the very finest Chicago-made guitars of the era. Although the Bacon company built many of the flashiest and finest (and THE most expensive) banjos of the 1920's, they had no experience or apparent interest in building guitars. They had dabbled with ukuleles and mandolins in the very early 1920's, and in 1923 had even ordered a few Martin guitars with a Bacon stamp but this was not followed up. The company had been able to prosper through the 1920's as it was and as late as 1931 Bacon literature offered nothing but banjos. When the high-end banjo market collapsed after 1930 Fred Bacon and David Day, both older men with decades of experience in the music business, took the expedient route and contracted with outside makers to supply them with guitars that could be finished off as "B&D's". While similar to some other Regal-built instruments, including the Tonk Bros. Washburn line, these 1930's "B&D" guitars are always distinctively appointed, and also the best that could be had. Although remembered mostly for budget grade instruments, Regal's factory-the ex-Lyon & Healy plant-was capable of turning out very fine product if the customer was willing to pay. Bacon and Day had very high standards, and anything sold under their names had to measure up! This late 1933 B & D Ne Plus Ultra Troubadour is a truly interesting Bacon/Regal creation, not only extremely striking looking but structurally quite unlike other period archtops. The 16" wide body is oddly squat, unusually wide waisted with an almost Dreadnought shape. The fairly thin, dramatically arched spruce top is carved with segmented f-holes not unlike period Masterbilt Epiphones. It is X-braced, which is most unusual for an early F-hole arch top but probably indicated Regal and/or Bacon & Day were taking inspiration from Martin more than Gibson. The back and sides are figured Brazilian rosewood, the back pressed into a high arch and reinforced with some stout transverse braces. The body is a hefty 4 1/2" at the rim, which combined with the elaborate arching makes for an unusually deep guitar. This very deluxe instrument features a deep sunburst finish on the top, with natural rosewood back and sides. The top is triple bound, the back and fingerboard are single bound. The large, unusually shaped Phenolic pickguard screwed directly to the top. The gold plated Waverly tailpiece is the transitional style typical of 1933-4 with the option if stringing either over or under the bar, and is hand engraved "B & D" on the base. The bridge is an adjustable ebony unit seen on a few other guitars of the time. The neck has a comfortable very soft "V" profile and is fairly thin back-to front, with a 1 3/4" nut width. It features the full B & D package of engraved, brightly painted celluloid fingerboard blocks and an extremely elaborate headstock face of finely engraved pearloid with copious multicolored rhinestone decoration. This Bacon specialty was carried over from the company's banjos and would have been done at the company's Groton plant, either sent out to Chicago for fitting or added after the guitars were delivered. This decoration certainly gives the guitar a unique character, and links it directly to the B & D banjo tradition. The headstock is topped off with engraved, gold plated early pattern Grover G-98 tuners. These machines are little works of art unto themselves, each one with a floral pattern hand engraved on the button around a letter "B". Similar machines later appeared on Gibson Super 400 and Martin F-9 -without the letter of course! 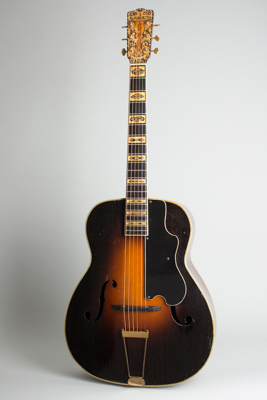 This "Ne Plus Ultra" model would appear to be Bacon & Day's first serious attempt to compete in the growing high-end professional archtop market of the early 1930's. The serial number is stamped into the back of the headstock and appears consistent with Bacon's banjo numbers of the period; in fact one of the few known later #9 Ne Plus Ultra banjos is a few digits away. At the time-late 1933- the direct competition would have been Gibson's L-5 and the fairly new Epiphone Masterbilt Deluxe. This guitar is quite different from either of those in both look and sound, and its extreme rarity suggests very few were sold. Still, it is a superbly made and fine playing guitar with a tone and feel best described as "somewhere between a rosewood Dreadnought and an L-5". Overall length is 41 in. (104.1 cm. ), 16 in. (40.6 cm.) wide at lower bout, and 4 5/8 in. (11.7 cm.) in depth at side, taken at the end block. Scale length is 25 in. (635 mm.). Width of nut is 1 3/4 in. (44 mm.). This guitar remains in all original, excellent playing condition. The finish shows some moderately heavy checking, mostly on the back. There are some dings and scrapes, mostly notably on the top but no major finish loss or visible cracks. The neck has been very carefully straightened with the original inlay, binding and frets fully intact and playability is excellent. It is simply one of the coolest looking arch top guitars of all time and no slouch sound wise either. It is housed in a period HSC for a larger 17" guitar, which better accommodates its unusual depth. Excellent - Condition.